How do our knapsacks survive the test of time? Scroll To Bottom Of Page and you be the judge. The one place we deviate from the original bags is the coating. Our Federal Knapsacks are faithful reproductions of original knapsacks. Years of research and study of many original examples have gone into perfecting our historically correct reproductions. The hardware is faithfully reproduced in correct wire gauge and finish. We do not use poorly made mass produced hardware. The cloth bags are made from imported linen canvas with correct hand flat-felled seams and painted after construction for better waterproofing. We use only top grade leather sewn with waxed linen thread for our straps and blanket rolls. We don't try to fool you by pricing our bag lower by leaving necessary things off and then making you buy them separately. Our bags come complete . Double Bag Knapsack aka "Mr. Knapsack"
This is our absolutely historically correct copy of the war-time issue doublebag knapsack . Made from imported linen canvas with correct hand flat-felled seams and painted after construction for better waterproofing. 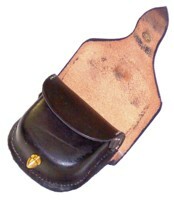 The V-pocket closes with buckskin ties. 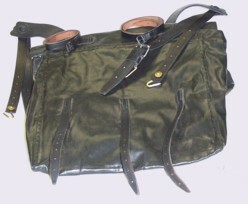 The leather shoulder straps have correctly scalloped ends, and the brass studs are covered with leather washers to prevent scratching the stock of the musket. 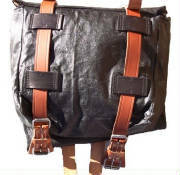 If you have ever inspected the interior of one of these original knapsacks, you will remember the profusion of black linen thread that was used to chain stitch all the straps in place. You will see this reproduced in wonderful detail in our reproduction because it is not clumsily imitated by hand but, actually sewn on an original machine. 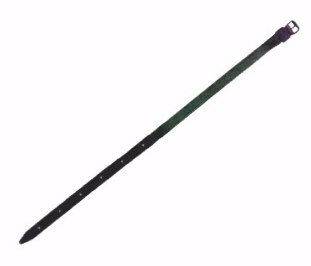 All our hardware is faithfully reproduced in correct wire gauge and finish. 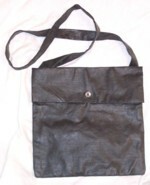 Our bags can provide the owner with years of service if properly cared for. 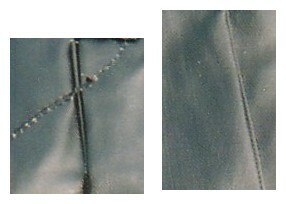 Below the photos of the new Double Bag Knapsack you can view photos of one of our bags that is over 35 years old that we repaired a few years ago for the owner. It is STILL being used to this day by its original buyer. We don't try to fool you by pricing our bag lower by leaving necessary things off and making you buy them separately. Our bags come complete with blanket roll straps, J-Hooks and Free U.S. Priority Mail Postage, Delivery Tracking and Delivery Confirmation ! The bag is complete and ready to take out of the box, load and take into the field. Blanket Roll Straps on top. tuds and buckskin ties prior to the civil war! 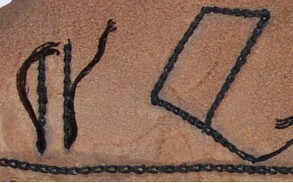 extensive use of machine chain stitching. just as the original bags were done. Close up of the buckskin ties. IF YOU WANT A FRAME You May Order One At The Same Time You Order Your Knapsack. 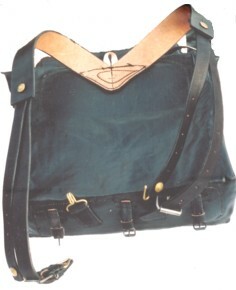 The early war doublebag knapsack bears a superficial resemblance to the U. S. government double bag. 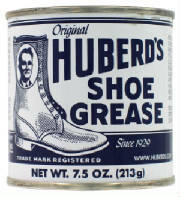 These were probably produced for issue by various state authorities unitl the Federal government could begin supplying knapsacks. We are pleased to offer this early design correctly machine sewn of cotton oil cloth. Based upon the original in our collection, it contains all the features common to the knapsacks in use before 1862.
specimen with one of our original 19th century chain stitch machines. The shoulder straps are cut square, and the rivited brass studs are left exposed. All the buckles and hooks are direct copies of originals. This knapsack has a smaller V-pocket than the later design. It closes with cotton herringbone twill tape ties. 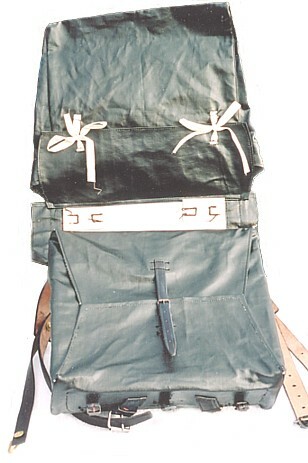 The knapsack with two overcoat straps. 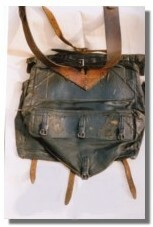 It was sometimes used with a wooden frame inside the knapsack. 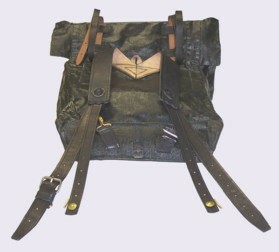 For those who wish to have a frame we make and sell a frame that fits inside our Early War Double Bag Knapsacks. So, why is there an "Early War" Doublebag Knapsack? The issuance and use of these non-standard packs, (often seen with wooden frames) is likely the result of state contract and issue. Apparently their use was fairly common in the early months of the war, gradually being phased out. An article from the New York Sun, reprinted in the February 1, 1862 Scientific American (page 67) discloses that 200,000 contract knapsacks were delivered in January 1862 alone and in the eight months previous 700,000 were delivered. Contract prices averaged $2.00 per knapsack. The major centers of production were New York City, New York, (Which produced more than half the total number produced.) Philadelphia, Pennsylvania, Newark, New Jersey and Wilmington, Delaware. that are hand made in our shop. 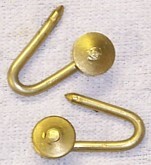 studs of the Early War Style Knapsack. and then hand-serged like the original. 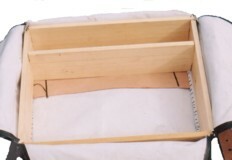 with the optional wooden frame in place. in place same as the originals knapsacks. All our replacement parts are made by hand of top grade materials and are the exact same parts as we use on our own products. Order extra straps and hooks for your gear or order replacements for lost or damaged parts on your equipment. A great way to get extra milage out of your investment in your equipment. Order with any item over $100.00 and save even more. order totaling $101.00 or more. 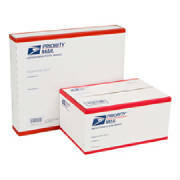 plus postage, insurance and handling. J-Hooks but are hand made one pair at a time. 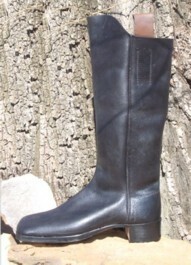 SAVE Only $6.00 per pair with any order of $101 or more. You be the judge. 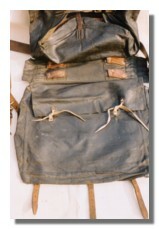 Here is a knapsack over 35 years old and still in use today. "dressed up" to use many more years. It is STILL in the Field Today. Don't throw away an old friend. Let us take a look at it first. 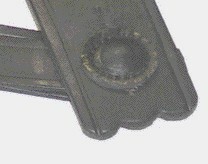 or purchase replacement parts for it below. knapsack for cost and shipping instructions. or MasterCard Debit or Credit Cards or PayPal. No Personal Checks, as a few ruined it for all.